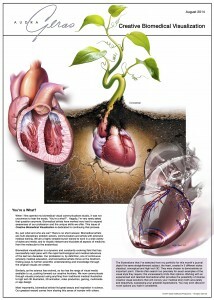 This is the 4th anniversary of the Geras Healthcare Productions monthly e-journal Creative Biomedical Visualization. Until now, the journal has only been available to our subscribers, but beginning this month, we will be posting the journal under our News heading. Creative Biomedical Visualization has been a very successful medium providing Audra Geras with the opportunity to share her thoughts on a variety of topics, including the science and concept development behind her illustrations, as well as other subjects related to biomedical visualization. We hope that you will enjoy this first posted issue!